USCG Station Sandy Hook is located on the barrier spit called Sandy Hook in Monmouth County, New Jersey. The station is one of the original Life Saving Stations built in 1848. The station at Sandy Hook is small in size and is only a short distance from New York City, which can be viewed from the base. The majority of the land surrounding base is owned by the federal government and is part of the National Park Service. The famous Gunnison Beach is nearby. 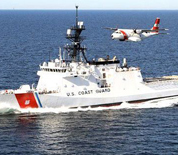 This USCG Station Sandy Hook NJ directory features the critical info you’ll need to navigate through the many facilities and recreational opportunities available on base.